This book is a series of lessons designed to walk you step by step from the first elementary guitar strumming and chords through to intermediate techniques that will make you sound like you’ve been playing most of your life. You also get a play-along CD featuring some great songs that have been covered by Eric Clapton, Led Zeppelin, Nirvana, Bruce Springsteen, Johnny Cash, and many other great guitarists. Order The Complete Idiot’s Guide to Guitar from Amazon.com today. 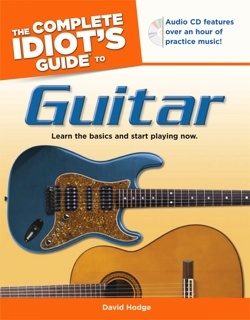 The Complete Idiot’s Guide to Guitar starts at the very beginning with learning how to hold the instrument and covers everything from reading tablature, bar chords, and strumming to playing the blues and rock riffs. Each chapter has practice songs, and the guide includes a play-along CD, so learners are playing guitar from the very first chapter. David Hodge’s book has everything I need, and most likely anything you’ll need, too, to grow in skill, confidence, and ability. In the two months since I’ve been using this book I’ve gone far beyond anything I used to do — or even hoped to do. As I progressed in the book (and accompanying CD–so helpful! )I have upgraded to an Ovation guitar, joined a band and played my first solo gig at a Memorial Service for a friend. This book is a resource I highly recommend! I think I would still be floundering without it. Get an idea what this book is like by checking out some of David’s free guitar columns on Guitar Noise.